SubEthaEdit 5. Code, Write, Edit. Together. Undo that works the way you do, without grouping too many edits together. Edit on multiple lines at the same time. Just option click the lines you want and type away. Edit HTML and see a live preview result. Even reloading automatically when you save referenced css or js files. Have as many windows open of one document as you like. Great for comparing multiple places, keeping a reference section open, or follow others. Use your desired flavor of regex for search. From simple shell to full power ruby style. Have multiple search result windows at the same time. Constrain search to just preselected parts of your document. See the structure and depth of your documents in the line number and folding ribbon. Fold text away based on depths or however you want. Select lines and/or depth easy with a single click. Select to matching braces by a simple double click. Harness the full power of your unix system by using see as your default editor. Pipe in and out of it and much more. man see for complete command-line documentation. Create custom scripts for your workflows. Integrate SubEthaEdit in your automations. Full support for dark mode in macOS Mojave. Of course you still can configure your syntax style independently as well. The modes reference a semantic hierarchy of styles, that can be customized to match your preferences. In addition to the keywords supplied by the modes, SubEthaEdit conveniently autocompletes based on all texts you have currently open. 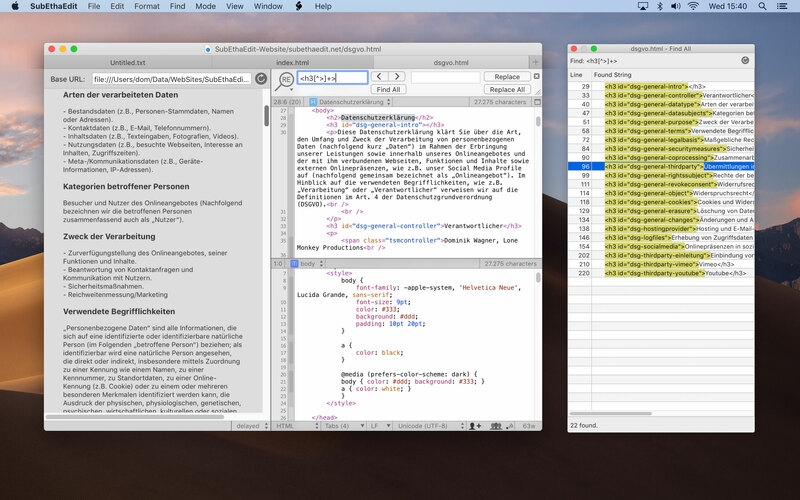 Modes can supply custom scripts to enhance the editing experience. E.g. a color picker for hex colors, linters for your language or setting of the executable flags for shell scripts. Invite somebody to a document. Write in the document, live, together. Follow them, or show them around by selecting text. Change their access permissions if needed. See who has written what, and even on local documents see what you have changed since you opened a document. 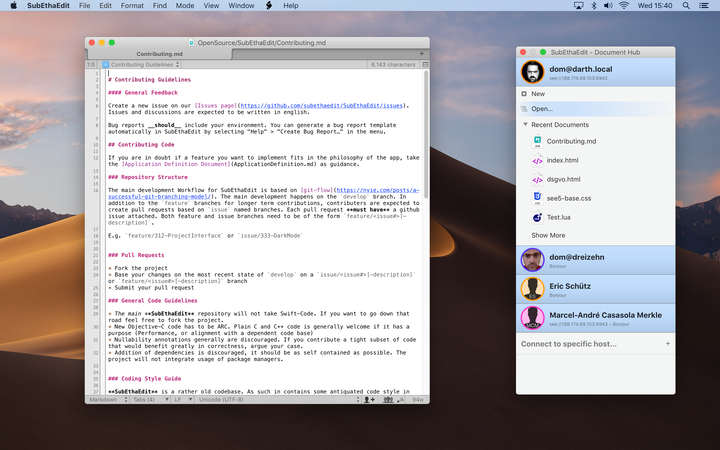 SubEthaEdit is owned and developed by the SubEthaEdit Contributors — an open-source project organized by Dominik Wagner (monkeydom). SubEthaEdit is distributed under the MIT license and you are more than welcome to fork it and contribute! If the app is misbehaving for you, or you are interested in new features, please create a new issue on our GitHub Issue page. Also feel free to get in touch with us.